Kawaguchiko Station Inn is one of the most affordable and convenient hotels in the Lake Kawaguchiko area. 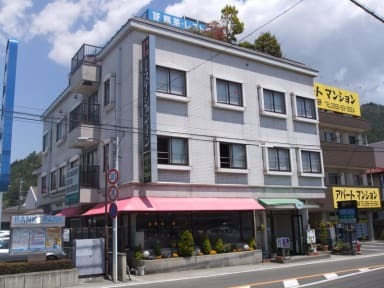 With beautiful views of the majestic Mount Fuji and conveniently located opposite the Kawaguchi-ko Station on the Fuji-Kyuko Line, the Kawaguchiko Station Inn is an excellent choice for any traveler needing a base from which to explore this exciting area. All of the Japanese style rooms are private and feature air-conditioning, TV, towels, toothbrush, soap and shampoo. bathroom facilities are outside rooms. We have a restaurant inside the hotel that offers Japanese cuisine and there are many restaurants nearby. A vending machine and a laundry machine is available. Great location, comfortable beds, really nice onsen. Will definitely stay here again! Fab hostel located right across from the train station. You can see Fuji-san from right outside the door. The beds are generally comfy but old metal bunk bed style so quite rattley if anyone is moving about. There was also a major Snorlax staying but the hostel can’t help that. By far the best thing was the Onsen!! The Onsen is on the top floor with wonderful views of Fuji. Great place to stay in Kawaguchiko! Only a few steps away from the train/bus station and a nice walking distance from the lake. Room and bed had enough space and I especially liked that there is a free space under the bed for the guests' luggage and other stuff. The onsen was the big plus for me with a nice of Mt Fuji. I will definitely come back! The Station Inn was perfect for what we needed. It’s located 2 minutes walk away from the major bus and train station, where you can explore all the surrounding area from. There are many restaurants nearby. I loved the Onsen on the top floor of the hostel - you get a perfect view of Mt. Fuji during your morning soak. There’s not much atmosphere in this hostel, many people are just passing through, and common room is quiet. But nice beds with lots of storage space and pretty good facilities. I was so happy with this place. I called ahead and the man on staff waited up late for me to arrive past curfew. The facilities were nice and the location is so special. When you walk out the front door (if it’s not too cloudy) you stare straight at Mt. Fuji. The beds are awesome - you sleep on the top bunk and the bottom is a personal space. Perfect for repacking a backpack. Very handy hotel located opposite Kawaguchi-ko station. Great facilities which also included a male and female indoor onsen with views of Mt Fuji. Does have a communal lounge where you could mingle with other travellers but for those who had just returned from trekking Mt Fuji (myself included), getting clean and then catching up on sleep were the top priorities. We stayed here before climbing Mt Fuji - great location, right next to the station which was perfect for what we needed. Pretty basic facilities and random set up with the basement lounge, but is great for a quick stop over and location is so good! The overall stay was nice enough. It's. Not so much of a hostel feel, rather more of a hotel. I got in early and the gentleman at reception did his best to get me an early check-in, which was great. The staff kept the bathrooms clean, but when they weren't around, this got a little messy. I'd suggest a few towels near sinks to help encourage people to wipe up their own mess. Descent, comfortable stay. I would stay again. This is a cheap hotel that now does backpackers. The rooms are clean with a bed and curtains partitioning arrangement. But the lounge/common room was not good. It smelled of some awful smelling cleaning product from the attached toilets, had clinical neon lighting, spartan table and chairs for eating and a tv. When I went to turn on the tv while eating some Lawson food, there was a dead fly right on the remote control. Watching a movie on my laptop on my bed was how I passed my time.